Brush Flush Out Performs Its Toxic Competitors! 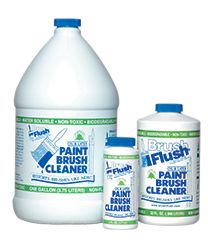 Brush Flush® removes wet or hardened oil – and latex-based paints, stains, varnishes, shellacs, urethanes and other surface coatings from brushes, rollers and sprayers. It’s biodegradable and water soluble and, it’s easy to use. 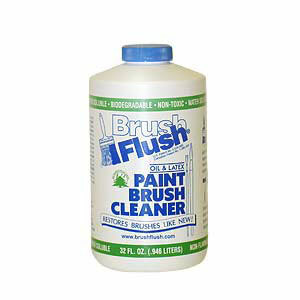 Pour a small amount of Brush Flush® into a container. 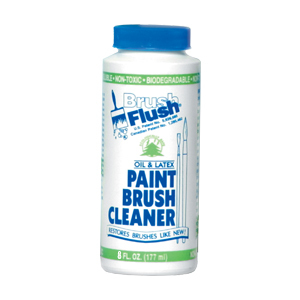 Work Brush Flush® into paint-laden brush, roller or sponge and rinse with warm water. Repeat as necessary. Totally immerse brush in Brush Flush® and allow to soak for several days, occasionally working the brush during this time. Continue soaking until bristles are completely softened. Rinse with warm water. Soak times for hardened brushes vary from several days to several weeks, depending on the type of coating and size of brush. Clean when wet. 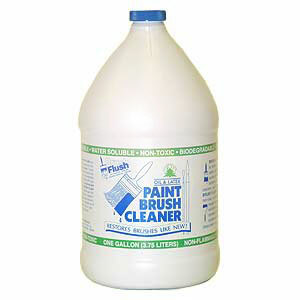 Pour a small amount of Brush Flush® into the sprayer and run it through the sprayer. Rinse with warm water. Repeat if necessary. Lubricate unit. CAUTION: Brush Flush® is safe and non-toxic, but as with all chemicals, should be used with care and kept out of the reach of children. In case of eye contact, flush eyes with plenty of cool water and seek medical attention immediately.